Medium to large sea turtle with a heart-shaped carapace that is keelless and light to dark mottled brown with five central scutes flanked by four pairs of lateral scutes. Each front flipper has only one claw. Adults weigh 150-300 pounds / 3 to 4 feet in length. Age at maturity range from 15 to 20 years. Nest in Florida from June to August. 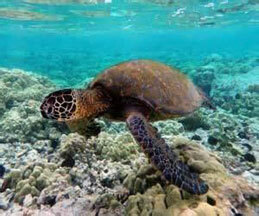 Green turtles can be distinguished from most other sea turtles by the single pair of scales on the front of the head. Named for the greenish color of its body fat. 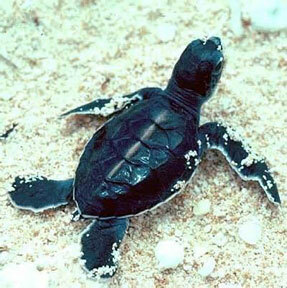 Hatchling green turtles are carnivorous; juveniles and sub-adults eat many things including man-o-war and jellyfish. When green turtles reach 8 to 10 inches in shell length, they begin feeding on seagrasses on shallow flats or algae growing on nearshore rock reefs. Adult green turtles are unique among sea turtles in being plant eaters. A population of immature green turtles can be found year round throughout the Indian River Lagoon, and an increase in the number of smaller turtles captured suggests that this population may be growing. 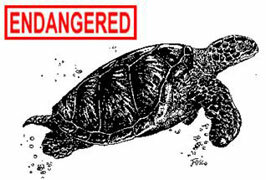 Mosquito Lagoon may be the northern limit of the winter range for green turtles. Roughly 500 to 8,500 green turtle nests are reported each year on the east coast of Florida, most of them between Volusia and Broward counties. Intense conservation efforts in Florida during the last 20 years have helped multiply green sea turtle populations especially in protected waters between Melbourne and the Florida Keys. 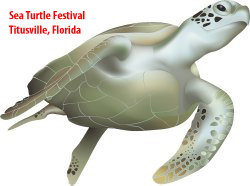 In recent years many populations of green turtles, including those in Florida, have been seriously affected by fibropapilloma. Turtles with this disease develop fleshy tumors on the skin and internal organs that can eventually impair vision, feeding, breathing, and other vital functions. 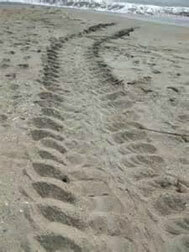 The crawl-pattern of nesting green turtles consists of side-by-side flipper tracks with a tail drag through the center.